You’ve certainly heard their carts clanking down the sidewalks of NYC, and maybe you’ve also seen them sorting through your trash bins before recycling day. These are NYC’s “canners”—people who collect giant piles of cans and bottles and exchange them for money at a nickel a piece. 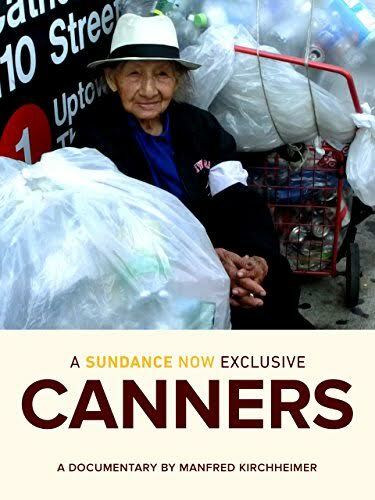 The recent documentary film Canners examines the lives of these dedicated folks who are just trying to earn some cash, and according to the NY Times, “delivers a powerful ethical message about what it means to live in a city, and how each of us can choose to acknowledge or ignore our fellow citizens”. 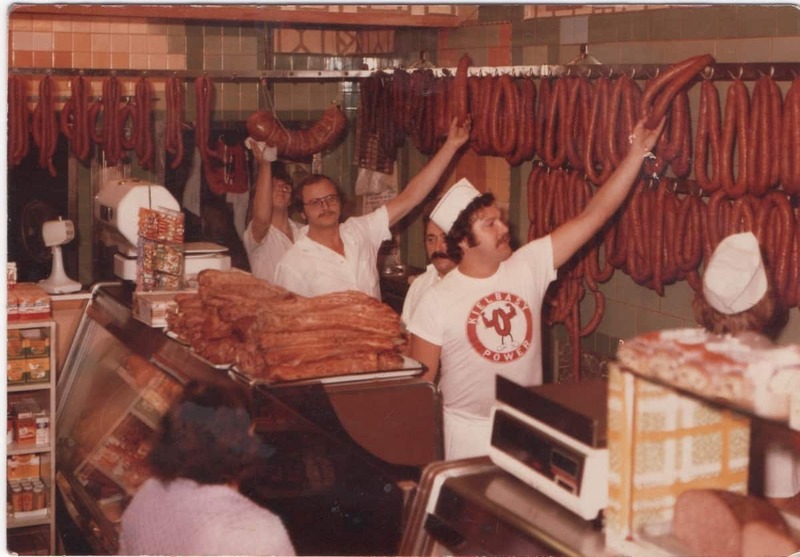 The film is screening this Saturday (1/27) evening at City Reliquary (370 Metropolitan Ave) at 7pm, with a Q&A session from director Manfred Kirchheimer. Also in attendance will be team members from Sure We Can, a nonprofit recycling center and community space featured in this film. 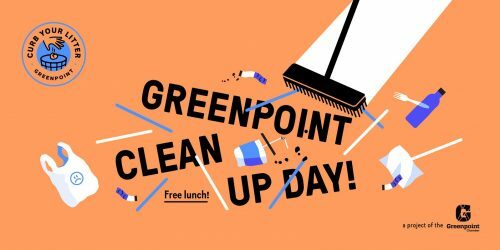 The Next Greenpoint Clean Up Day is This Weekend (8/12)! Join the Greenpoint Chamber and Neighbors Allied for Good Growth for the third Curb Your Litter: Greenpoint clean-up day of 2017. This time, they’re partnering with the Newtown Creek Alliance to pay special attention to curbing the litter that enters into our waterways. They will pick up street litter in Northeast Greenpoint (east of McGuinness Boulevard and north of Norman Avenue). As always, all volunteers will get a free lunch as a thank you for their efforts. 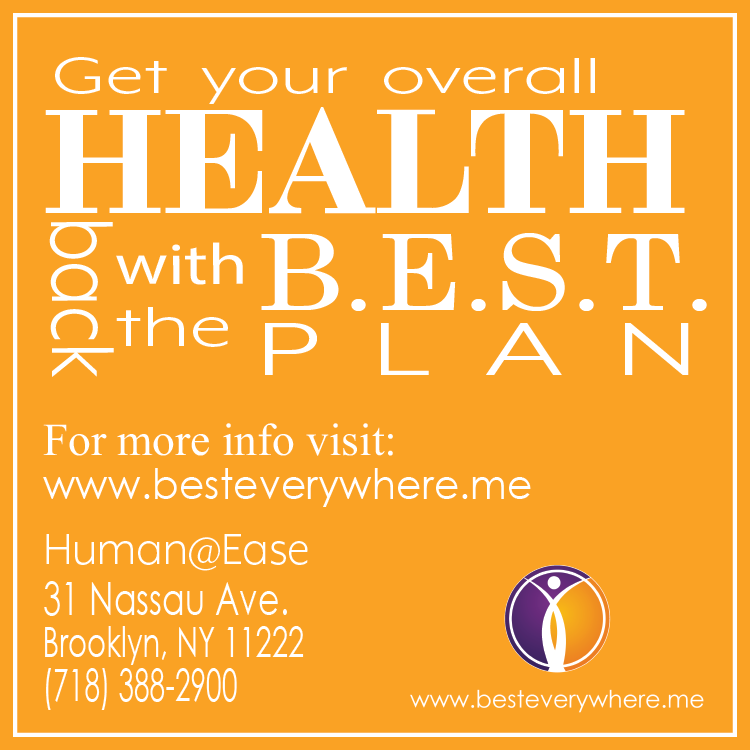 Meet at Broadway Stages, 203 Diamond Street. 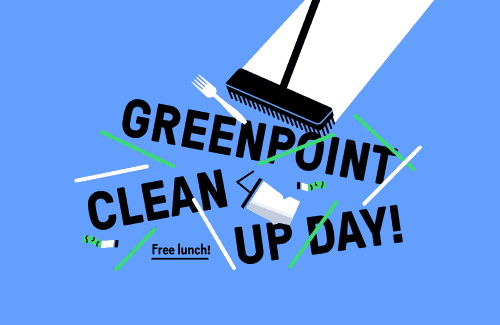 Free Lunch & Help Clean Up Greenpoint Today (7/8)! 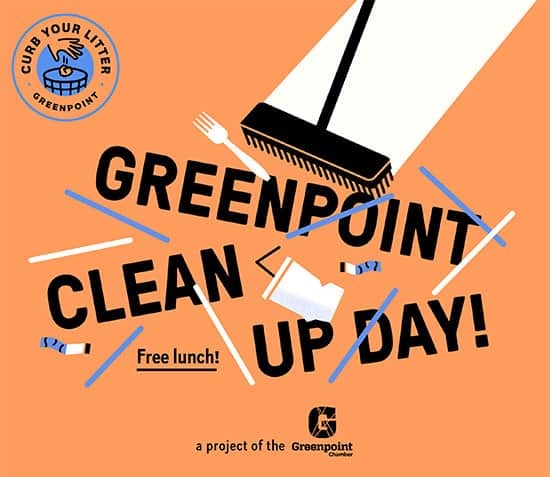 Neighbors Allied for Good Growth and Greenpoint Chamber are hosting the 10th Curb Your Litter: Greenpoint, their second clean-up day this year, on TODAY, July 8th. Street litter will be picked up in Northwest Greenpoint (west of McGuinness Boulevard and north of Calyer Street) from 10am-2pm. FREE LUNCH will be provided! Meet at the Greenpoint Reformed Church (136 Milton Street). RSVP on Eventbrite. Though full-size G Trains are very much on the agenda for the coming L Train shutdown, here’s another thought: extending the E to run along the G track to take the pressure off all of us out here. Because the L Train shutdown is consuming all our thoughts lately, senator Daniel Squadron (plus 32 other officials) are calling on Cuomo, de Blasio, and MTA Chairman Thomas Prendergast to start working on better solutions now. One more G Train thing and then we’ll stop. Apparently a small number of G Trains are being used as a test group for those futuristic digital display screens you see on other trains from the modern era. Greenpoint’s getting new trashcans, and they’re going in the places community members have suggested. If there’s a spot you’ve got in mind that’s in dire straits for a garbage receptacle, call 311. Things are changing at Five Leaves and Nights and Weekends — but hopefully only in a behind-the-scenes kind of way. Chef Ken Addington is leaving his post there, but he’s apparently got something else up his sleeve. If sewage-related podcasts are your thing, check out this DNAinfo reporter’s chat with Zainool Ali, the manager of the Newtown Creek Wastewater Treatment Plant. What about urban hikes? Are those your thing? On August 6, Newtown Creek Alliance Historian Mitch Waxman will be taking interested parties through our industrial borderlands. Investors Bank recently cut the ribbon at its new location on Manhattan Ave. 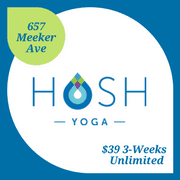 However, it’s already made moves in the community by getting in with local advocacy groups like the Greenpoint YMCA and the North Brooklyn Development Corporation. There’s still time for CitiStorage owner Norm Brodsky to accept the city’s offer of $100 million, but his public auction of the land recently closed, and he’s been playing his cards close to his chest. The Greenpoint entrepreneurs behind spice savant Greenpoint Trading Company are laying on the heat with an expansion into South Bushwick. Is “Greenpoint” becoming synonymous with “gentrification?” This week, Forbes spotlighted the decline of Polish businesses, and McSweeney’s did a McSweeney’s. Curb Your Litter is tackling Greenpoint’s abysmal person-to-garbage-can ratio with a new interactive map that lets you recommend locations for trash bins. As a matter of fact, “person-to-garbage-can ratio” is also pretty good shorthand for life in New York City. Protect your package, people. 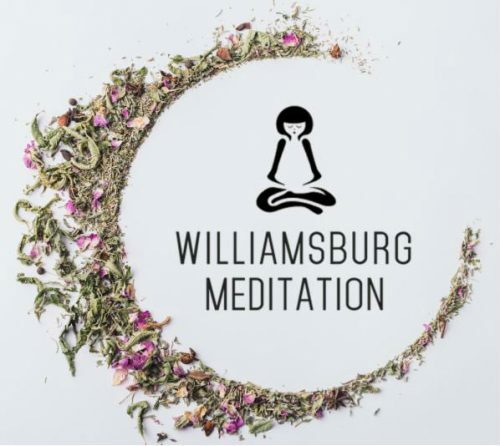 Greenpointers posted this video on our Facebook page earlier this week, but in case you missed it, here’s something that might make you think twice about buzzing in a stranger. Jack and Joshua Guttman just filed an application to build a new hotel on West Street at the abandoned Greenpoint Terminal Market complex. Perhaps the proposed rooftop bar will be distress-signal-distance from the Wythe Hotel’s. Another five-story rental going up on West and India hopes to offer a more “approachable, neighborhood feel” counterpart to the big towers going up around it. The Franchesca Mini Market between Eagle and Dupont has certainly seen better days. 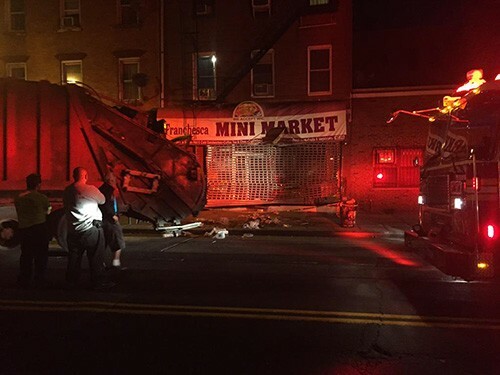 Not much word yet on what created the behemoth-shaped hole in the bodega’s storefront, but one tweet suggests it was a garbage truck accident. Another Ben Stiller movie? It’s happening here in Greenpoint. The crew of Zoolander 2 is doing their film thing at the site of Hansel’s loft. If you haven’t already heard, Greenpoint was crowned NYC’s King of illegal dumping recently and that isn’t including the over 400lbs of litter that was picked up in the first Greenpoint Clean Up Day. Thankfully, the Greenpoint Chamber of Commerce is addressing this problem with their “Curb Your Litter” initiative and has organized another clean up day tomorrow (8/22). If you thought the pilot composting program was good idea for Greenpoint then wait until you hear the latest news coming from the Department of Sanitation. The agency has officially upped its own ante by announcing that Greenpoint and Williamsburg streets will be getting nearly 200 new solar powered trash compactor bins in just a few short weeks. Dubbed Big Belly Solar Compactors, these trash bins will be replacing the traditional green wire cans-a common fixture on nearly every major street corner in the neighborhood. So what makes these new compactors so great? A peek on the manufacturer’s website boasts Big Belly Solar’s trash bins can compact over 150 gallons of garbage compared to only 35 gallons of the standard-issued green trash can. The company says Big Belly cans are aimed at reducing fossil fuels and are designed to be used without the use of hydraulic fluids. 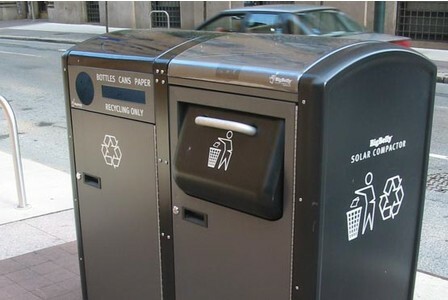 To date, Big Belly Solar Compactor bins have been such a hit they can be found everywhere–including 13 US cities, Scotland, the rest of the UK, and Sweden. 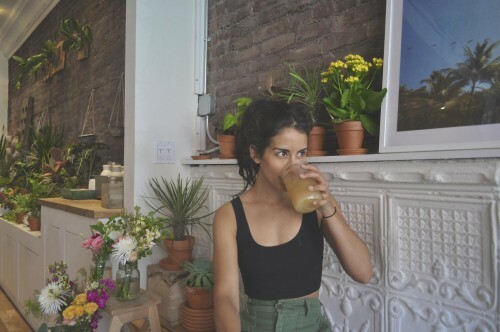 Soon enough Greenpoint will be added to that growing list. 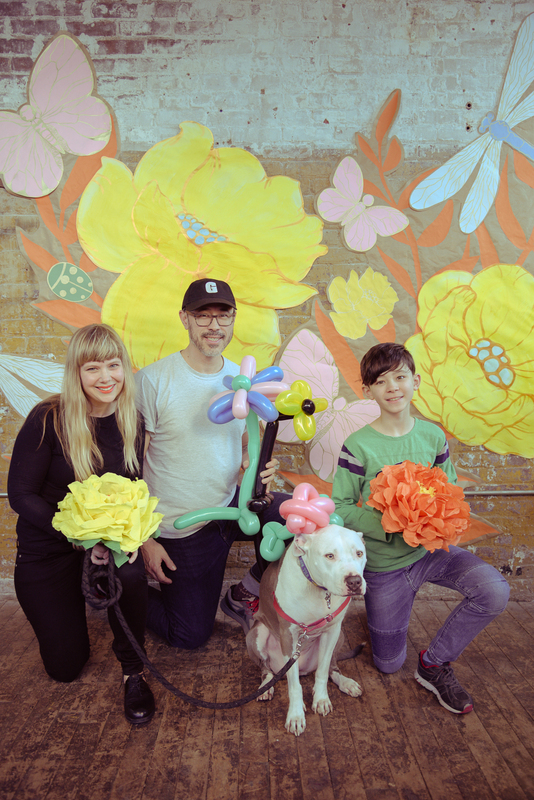 The Hook-Up – Rat Mites / Get Rich on AirBnB / Greenpoint Landing Park / Trash? NIMBY!